Who says a futon has to be an expendable piece of furniture made from cheap materials? 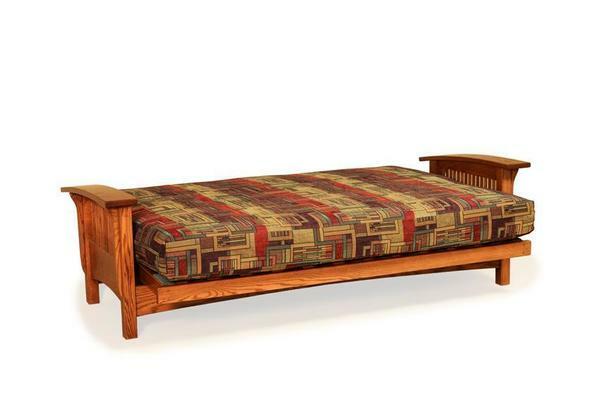 Our Amish Mission Futon Bed is built to last in your home for decades to come. Invest in a futon bed that is made with care just for you and your family to enjoy. The Amish handcrafted Mission Futon Bed is comfortable, sleek in its design, affordable, and made using beautiful and durable solid wood. This Amish bed includes the frame, mattress, and micro-fiber cover in the fabric of your choice. The micro-fiber cover comes standard with the futon bed and is available in an array of 7 different colors for you to choose from. You can also order an upholstered fabric cover as an added upgrade. Your choice of up to 4 throw pillows can also be added to your Amish Mission Morris Futon Bed order. Have your new futon bed ready to use as soon as it arrives at your door! Please give us a call at 866-272-6773 to receive finish and upholstery samples in order to get the perfect fit for your home. Futon Sofa Beds add style, function, and comfort to any room. They're perfect for the living room, guest bedroom, children's room, or den. We use the highest grade of foam in the construction of our Amish Mission futon. This fire resistant material is sure to keep family and friends comfortable for years to come. The frame of the Mission futon bed is shown here in gorgeous oak topped off with our harvest finish. If you find yourself in the sunny Sarasota, Florida area, we would love to have you stop by our Amish furniture showroom. Get up close and personal with our handpicked pieces built to last a lifetime. Note: Includes Frame, Mattress and Micro-Fiber Cover. Customer can provide own fabric or leather. Call for more information. 6 yards of fabric or leather is needed.